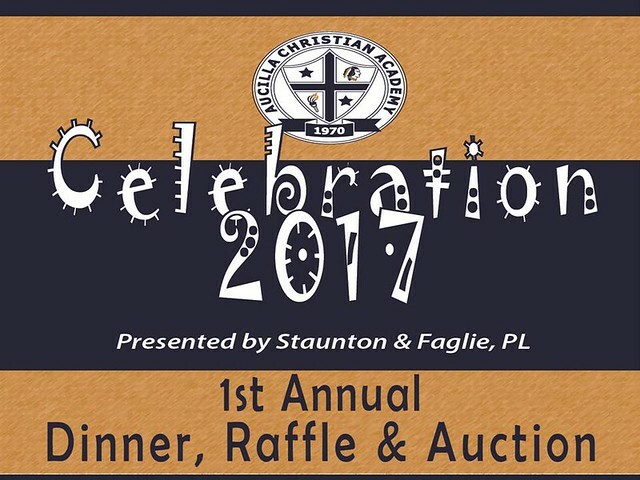 Hundreds of Aucilla Christian Academy supporters gathered on Saturday, February 25, 2017 at ACA to Celebrate ACA’s 47 years of ministry and raised $69,000 to benefit the ministry, allowing the board to keep ACA’s tuition one of the most affordable for private schools in the state. A delicious prime rib dinner was enjoyed by all with entertainment and testimony by students, raffle drawings for prizes throughout the night, along with a fun game and live and silent auctions. “The support we received at our very first Celebration, which combined our long-time dinner raffle and auction events, was a huge blessing from God, and we cannot say thank you enough,” said Principal Richard Finlayson. “Grandparents, parents, alumni, area businesses and supporters attended and we couldn’t have been more thankful.” To learn more about ACA, to make a donation or to receive information about ACA’s second annual Celebration event, call 850-997-3597 or visit aucilla.org. To view more photos, click the photo above to view slideshow.